When selecting plants, remember that a diversity of plants will attract a diversity of wildlife. We have discussed edge and the importance of providing both food and cover for wildlife in earlier sections. Now, we will take a look at planting grasses, trees, shrubs, and wildflowers in more detail. Native grass refers to a variety of species which have survived for thousands of years. These grasses have adapted to the environment of the region they are naturally found in. Their winter hardiness, drought tolerance, along with disease and insect resistance make them practical and maintenance free. The average lawn planted with common Kentucky bluegrass requires about 10,000 gallons of water per year to keep green. This is compounded with the use of fertilizers and pesticides which ultimately end up in local rivers and streams-a high price to pay for the coveted "golf course style" lawn envied by midstream America. By converting all or part of your lawn to native species, you can save a lot of time in mowing, maintenance, and watering. This all adds up to a cleaner and better environment, financial savings, a habitat to attract wildlife and an overall beautiful landscape. Native grasses are divided into two groups referred to as "warm season " and "cool season" grasses. Warm season grasses begin growing later than the cool season grasses and continue to grow into the summer months without watering. They include species such as buffalo grass, blue grama, the bluestems, switchgrass and sideoats grama. The cool season varieties such as the wheatgrasses and needlegrass emerge early in the spring providing early green. In the hot summer months, these species turn brown and go dormant without supplemental watering until cooler weather in the fall. The decision to plant native grasses is one you can be proud you made. These species take a little more effort to get started but will provide wonderful long-term benefit for years to come. Refer to Appendix E, Sources of Further Assistance, for addresses and telephone numbers for these helpful agencies. A properly designed arrangement of trees , shrubs and vines within your yard can provide numerous benefits both to you and to wildlife species. "Conservation is a state of harmony between men and land. We abuse land because we regard it as a commodity belonging to us. When we see land as a community to which we belong, we may begin to use it with love and respect"
Trees, shrubs and vines you incorporate within your landscaping plan can form a quiet, secluded refuge from unwanted urban and rural surroundings. By properly positioning and selecting appropriate species, vegetation can provide a visual barrier in desired locations and help reduce noise produced by adjacent roadways, noisy pets, streets and houses. Home heating and cooling is something that is normally not considered when thinking about landscaping. A well-designed plan can significantly reduce the effects of wind and extreme temperatures as well as provide shade or sun where desired. Trees and shrubs can be over five times more effective in reducing summer heat than shades or drapes. Home heating costs can be reduced in the winter by up to 25%. The beauty provided by a variety of vegetation added to your yard is reason enough to landscape for wildlife. Species can be grown that will produce any color of the rainbow during some time of the season. This adds significantly to the value of your property and enjoyment of spending time in the yard. A benefit that shouldn't be forgotten is that of harvestable awards in the form of nuts, berries and fruits which can be grown in this climate. Especially in larger acreages outside of town, a small business could be made of producing trees for others to use in landscaping, growing fruits to make preserves, or producing vegetables for the farmer's market. If making crafts is your fancy, shrubs, vines and other plants can be grown specifically for this purpose. Finally, we can't forget the primary purpose we chose to begin this project in the first place- attracting wildlife. To accomplish this with trees, shrubs and vines, we will discuss some of the better species for this purpose and where to obtain them. The best developed plan is one in which a great variety of plants are included. There are as many different plant combinations as there are planners but there are a few things to consider before starting. First, Remember to allow sufficient space for plants to expand to their mature size. This is one of the biggest mistakes made during the planning process for trees and shrubs. Most often, the tendency is to plant things too close, not realizing the potential end state. Refer to Appendix A for tree and shrub diameters. Conifers, which do not lose their leaves and include species like the blue spruce, ponderosa pine and eastern red cedar are excellent for screening, breaking the wind, and providing excellent cover year-round. Junipers provide this same cover and provide berries as food for wildlife. By positioning these species on the north and west sides of your house, wintery winds and cold can be minimized. On the other hand, deciduous trees lose their leaves and are therefore a good choice for the south side of the house. A mature, tall deciduous tree like cottonwood, basswood, green ash or oak will provide shade to keep the house cool in the summer but will allow winter sun to penetrate when leaves are gone. Oak provides food in the form of acorns relished by squirrels, deer, and wood ducks. Grape vines, woodbine or Virginia creeper can also be used on the south side of the house on trellis located in strategic positions to block porches, decks and windows that get excessive sun in the summer. Generally, the tallest tree species, whether conifer or deciduous, should be planted at the edge of the yard and shorter species toward the inside. This tiered effect will allow you to plant three or four layers of vegetation and still have the capability of viewing all of them from your house or porch. Maturity time of trees and shrubs should also be considered because some species grow much faster than others. For example, an oak tree could take 50 years to reach the same height as a cottonwood would in under 10 years. A nanking cherry will mature quickly and provide fruit in under five years but will not live as long as a buffaloberry or chokecherry. Whether or not a shrub or tree produces a fruit may be worth considering within your plan. Most native fruit producing trees and shrubs are relatively short in height and work well on the inside of taller windbreaks, in clumps within clearings, or as hedgerows by themselves. Some of wildlife's favorite include native plum, honeysuckle, chokecherry, midwestern crab apple, buffaloberry, juneberry and skunkbush sumac. Take into consideration during planning that hedgerows and other dense plantings will collect snow, generally on the west and south sides. You may want to avoid planting on the north side of features like a driveway but purposely plant in an area where added moisture is advantageous in the spring. Whether one should plant all native trees and shrubs is a question that should be considered. Native trees and shrubs are those which have lived in one area for centuries and have adapted to our extreme climate. Exotics are those that have been introduced from other areas around the country or world. There can also be a difference within a state itself. Take for example that junipers are native to the badlands of North Dakota but not to the eastern part of the state and that the paper birch grows naturally in the wet areas of the Turtle Mountains but not in the southern two-thirds of the state. All of these things should be considered before planting. The reason to keep much of your planting plan in natives is that they have a higher survival rate, may be more resistant to disease and blend in better with the natural environment. Some exotics, however, such as the Russian olive, do well in our climate. The argument against these type of species is that they do so well that some people believe they may take over native prairie habitats or other areas if left unchecked. It is true that too many of any species, a monoculture, is not good, but some exotics do have definite wildlife value as cover and as late winter food sources. The choice many times becomes a personal one. Consider species like the flowering crabapple and European mountain ash. Berries from these trees provide a great source of food for late fall migrating birds like the robin and waxwing, and for resident species like the sharptail grouse and pheasant. Berries may also remain on the limb and provide a source of food in the spring for migrating birds caught by surprise in a spring snowstorm. Flowering crabs, mountain ash and silver maple are unmatched for adding a variety of color to your yard. The spring bloom of flowers on the crab, the orange berries of the ash and brilliant red leaves of the fall silver maple can spice up any yard. So where do you get trees, shrubs and vines for your landscaping plan? Trees, shrubs, and other plant materials can be acquired for backyard plantings through three main sources. One source is your local greenhouse or landscaping shop. These businesses normally have a large selection of trees, shrubs, vines, and other plants from which to choose. They are able to answer questions and provide advice in planting along with selling tools and other items useful in landscaping. The advantage of this route is that, as a beginner, you can get more help and feel more confident in your choice. The disadvantage is that you will pay a little more for this service. Another source for trees and shrubs is your local Soil Conservation District. These agencies provide plants and related materials for the purpose of conservation plantings. The disadvantage of acquiring trees and shrubs through this source is that the varieties are limited to certain species. Also, their business is more geared toward those who know exactly what they want to purchase. Most of the trees are small seedlings, the size that can be planted with the use of a tree planter--about 18-24 inches high. This is also a disadvantage because the trees take longer to reach a height which is valuable to wildlife and acceptable to most home owners. County soil conservation districts are also geared toward conservation plantings rather than the purchase of several trees for an urban back yard, however you should check with them to make sure, as some counties may differ in their production and policy. The advantage of the county approach is that trees are relatively cheap and can even be planted by the district for a slightly higher price. Programs for cost share may be available for those who qualify. The final approach to backyard landscaping with trees and shrubs is to use a mail order catalogue. Mail order outfits have almost anything you can possibly desire. The disadvantage is that you must be careful to select plants that will tolerate your soil and hardiness zone. Also, the price is substantially higher than the soil conservation district and plants may not end up on your doorstep when you wish to plant them. All of these options have their place and you may find that using a combination is the key. The addition of any size native flower planting will transform your back yard into an eye-catching splash of color and attract a variety of insects which in turn attract songbirds and other wildlife. Native flowers, like native grasses, require little maintenance after the first couple years of planting. Site selection, site preparation and initial establishment, however, can take time and patience. It is recommended that you do some research prior to establishing your first planting and that you start with a relatively small area. As your knowledge grows with experience and success, you can increase the plot sizes. 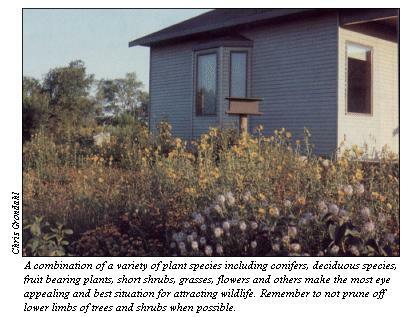 Choosing and preparing a site is critical for native flower plantings. The last thing you want to do is rush into a planting without thinking about whether a site is suitable for wildflowers and what conditions must be met for wildflowers to survive. Native flowers typical require sites with full sunlight. Introductions into areas with exotic grasses or noxious weeds may result in failure. To help insure a successful planting, the site must be prepared properly. Preparation involves eliminating undesirable weeds or grasses presently growing at the site and creating a substrate wildflower seeds desire. Unless you are enhancing existing prairie with wildflower seeds, all vegetation should be eliminated with Round-up herbicide. A good time to kill existing vegetation is immediately in the spring, after plants have been allowed to emerge. A couple weeks after spraying, mow off the dead vegetation close to the ground. If the soil is hard and compacted or existing vegetation needs uprooting, till the soil at a very shallow depth. If the soil is titled any more than two or three inches deep, conditions will encourage more weed seeds hiding in the soil depths to germinate. Wildflower seeds prefer a fairly compacted seed bed and seeds covered by more than 1/2 inch of soil may not germinate. Wait at least a month to determine whether the site is clean by monitoring weed growth. If an appreciable amount of growth is witnessed, repeat the Round-up process, waiting at least two weeks before planting wildflower seeds. Successful planting with this preparation scheme can be accomplished in the late May to early June time frame. In this scenario, artificial watering may be required. Fall plantings are more frequently recommended because seeds are allowed to undergo their natural dormancy period and take advantage of early spring moisture. Fall plantings should occur a month or two after the first hard frost. Late October or early November is ideal. When the site is ready for planting, determine how many species you want to use. There is the possibility of over 40 species from which to choose. Some are annuals and some perennials. Your mixture should include both types. The annuals will show flowers the first year, mature, spread their seeds and die. The perennials will put most of their energy into producing roots the first year and will not flower until the second or third year, depending on conditions. A perennial will come up again and again from the same root. Annuals will always come up in new areas wherever seeds have naturally dispersed or been planted. One method to choose species is to simply get as many as possible. Another way would be to look at photographs of the flowers you like best and choose a dozen of your favorites. For example, if you are attracting a species like butterflies, purple and white flowers are best. for local flower and grass seed sources. An important point to remember in buying premixed, packaged flower seeds is that they should not contain an invasive, noxious weed species the state is trying to control. For example, purple loosestrife has been a flower component of many seed mixes coming from the east and a real problem in choking out other beneficial plants in wetland environments. If you are not sure, check with someone familiar with flowers before buying. You could be doing more harm than good in some cases. Next, determine how thick you want the seeds. 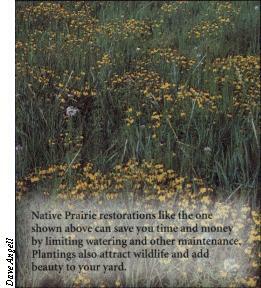 This can vary depending on what result you desire and whether the flowers are being incorporated with native grasses. If grasses are being included with wildflowers, about 25 seeds per square feet should suffice. If flowers are being planted by themselves, about four times more seeds are needed to help offset weed invasion. From personal experience, it seems hard to plant too many seeds. Thick flowers can be thinned or used as a seed source in further plantings. The only thing that will stop you from planting too thickly is the high cost of wildflower seed. The actual process of scattering seeds can be accomplished by hand or by an adjustable spreader. When spreading by hand, mix the seeds with about four parts to one part fine, damp sand. Some flower seeds are very tiny and won't be evenly distributed otherwise. Spreading by machine can be aided likewise by using a material such as cornmeal. After seeding, lightly rake over the area and pack either by foot or by a weighted roller. Mulching thinly with clean straw or grass will retain some moisture and prevent seeds from blowing or washing away. Water immediately after mulching and keep damp during the growing season. Now comes the hard part about native flower plantings-waiting a couple of seasons to see positive results. 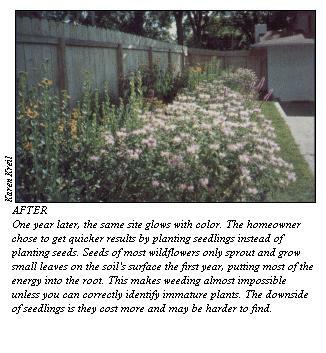 This is especially true if most of your planting consists of perennial species. They will only grow leaves very close to the ground the first year. Weeds are almost a given even in a very well prepared site. Many will have blown in from adjacent areas during the first fall. Simply keep good tabs on the site and pull out weeds as they come up. Learn what the leaves of various wildflower plants look like "hands-on" from a neighbor who may possibly have a flower plot. In the fall, plots can be mowed after flower seeds have matured. If native grasses have been incorporated into your flower plot, do not mow until they reach six inches in height. 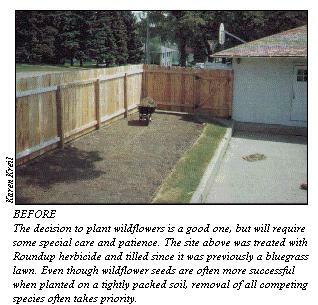 Reseeding can occur after the first or second year to fill any bare spots. This can be done in the late fall or spring. If weeds or unwanted cool-season grasses get out of control, Round-up herbicide, burning, or a combination of both can be used early in the spring before warm season grasses and wildflowers begin to emerge. Wildflower plantings have become more popular and several companies around the state now sell wildflower seed. 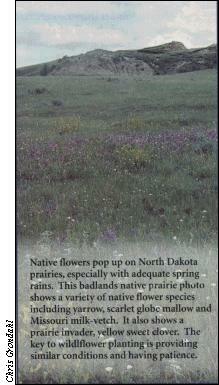 For more information, reference Appendix C, Native Plant Seed Sources. 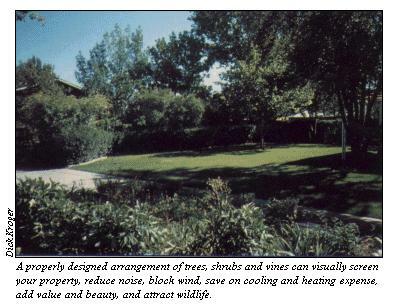 A list of other components that attract wildlife is found on page 24. This list includes things such as feeders and food plots, water, nest boxes, snags, and brush piles. Feeders are discussed briefly on page 11 with references to additional information. Food sources for butterflies and hummingbirds are covered on pages 11 through 13. Recommendations for making water available are provided on pages 13-17. Page 18 discusses brush piles and snags. Finally, information on nest boxes and cavity nesting species is found on page 19. All of this material can be supplemented by making contact with a professional or referencing Appendix E, Sources of Further Assistance.